Diabetes Mellitus is a chronic metabolic disorder characterised by the body's inability to either produce enough insulin or the cells are not assimilating enough sugar. Diabetes thus can occur when the pancreas does not secrete enough insulin (Type-I/Childhood Onset/Insulin-Dependent Diabetes Mellitus/IDDM) or if the cells of the body become resistant to insulin (Type II/Adult Onset/Non-Insulin-Dependent Diabetes Mellitus/NIDDM). Hence, the blood sugar cannot get into the cells. When this happens it leads to serious complications such as greatly increased risk of cardiovascular disease, kidney disease, infections, circulatory problems, and loss of nerve function. The classic symptoms of diabetes are increased thirst, increased hunger, and increased urination. There are some nutrients and herbs that affect glucose metabolism which may help to control blood sugar such as chromium, fenugreek, gymnema, and ginseng. Ginkgo can help to prevent complications of poor blood sugar control by promoting healthy circulation. Supplementing with daily vitamins and minerals, plus antioxidants and essential fatty acids can also be beneficial. Especially important in this category are GLA, vitamin C, magnesium, and niacin. Diabetes may cause individuals to be deficient of various nutrients. Replacing these nutrients may not only help, but may also help prevent complications. Effective control of diabetes requires an integrated approach which also includes exercise, weight control and a good diabetic diet. Controlling calories, reducing milk and dairy consumption, plus reducing simple carbohydrates (refined sugars) while increasing complex carbohydrates (starches) and soluble fiber is important to good diabetic management. Lifestyle changes plus medical attention are both necessary. Diabetes can be a serious condition. Alternative treatments for diabetes should not be attempted without the permission of the treating physician. GlucoFactors® contains high dose Chromium in combination with alpha-Lipoic acid, Gymnema and Fenugreek to support regulation of carbohydrates and healthy glucose metabolism. Chromium is an essential component of glucose tolerance factor. See your healthcare practitioner to determine if you need additional chromium. Support for blood glucose regulation. Yeast free chromium 200mcg is an amino acid chelate, a biologically active form of chromium not derived from yeast. Chromium plays a key role in glucose metabolism and has been shown to amplify insulin signalling. This effect is directly dependent on the chromium content of chromium binding oligopeptide, or chromodulin. A chromium deficiency may lead to blood glucose disregulation, insulin resistance and many subtle adverse metabolic events. Repletion with high dose chromium may improve or restore function and prevent such events. To improve insulin sensitivity and carbohydrate metabolism. Methyl-Max contains folic acid, Vitamin B12, activated Vitamin B6 and serine. These key methylating factors are involved in healthy homocysteine metabolism. The active ingredients in Activated B6, when appropriately prescribed, may assist patients suffering from the above conditions. This statement does not imply or make a claim for a cure of these disorders. 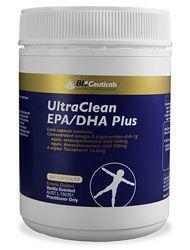 The use of Activated B6 should be based on the published and relevant scientific and clinical data for each condition. 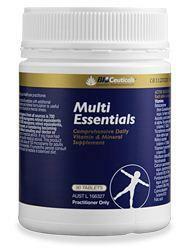 Activated B Complex provides the activated forms of several B vitamins. B complex vitamins may be beneficial during times of stress and help to support general well-being. Aminoplex® in choc-coconut flavour is a low-reactive rice protein concentrate derived from whole brown rice that delivers 33g of protein per serve. Quality protein in the diet is essential for healthy, toned muscles and cellular repair. Rice protein concentrate is considered to have a low digestive allergen potential. Ideal for vegetarians, vegans and individuals with increased protein requirements. Contains natural digestive enzymes (bromelains from pineapple) to assist in the breakdown and assimilation of protein. Features a break-bar for those who have trouble swallowing larger tablets. 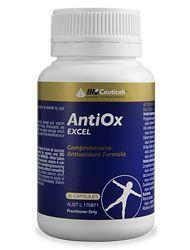 AntiOx Excel features a scientifically formulated blend of nutrients and herbal extracts to provide maximum protection against free radical-induced damage. AntiOx Excel may be beneficial for oxidative stress, detoxification processes and as an adjunct for conditions that require antioxidant support. Contains a complex mixture of antioxidants and phytonutrients to assist in the maintenance of general wellbeing. Provides botanical antioxidant activity from standardised herbal extracts of grape seed, milk thistle and ginkgo plus lycopene. Rich in trans-resveratrol, a powerful red wine antioxidant. Each capsule provides 112.5mg of trans-resveratrol, making AntiOx Excel the strongest trans-resveratrol complex on the Australian market. A natural source of pterostilbene-containing blueberries. Pterostilbene is a potent antioxidant with numerous health benefits. Combines key nutrient antioxidant factors vitamins A, C, and E, plus manganese, selenium and zinc.